E-girls saat event Odaiba Gasshukoku 2013 "Ikazaya Exile PARK"
On July 11, EXILE's sister group E-girls appeared at the private press conference for the annual summer event "Odaiba Gasshukoku 2013" ("United States of Odaiba 2013") event, which runs from July 13 – September 1. The event takes place next to the Fuji TV building in Odaiba, Tokyo. E-girls members served as PR ambassadors for the "Ikazaya Exile PARK" area of the event. Every year, the "Ikazaya-" area has long, snaking lines. This year, it will have a larger space for the "Izakaya-", and it will be set in the "Gasshukoku Sun-Sun Island", the main area of the event. Visitors can enjoy the menu that is produced by all of EXILE members, Sandaime J Soul Brothers, and E-girls. 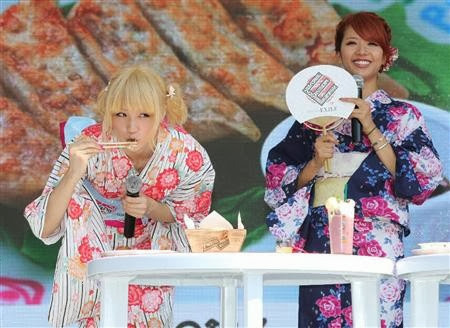 On stage, the E-girls members' taste tested menu items wearing yukatas. Aya (25) suggested that she would go to the store, saying, "Whenever I have time, I would definitely like to come to here." On July 24, E-girls will perform live along with the other "EXILE TRIBE" groups.